You are here: Home » Honolulu Real Estate » Rent or Own? Why rent, when you could own! Rent, is money thrown away. After years of renting, what do you have to show for it? Nothing! Every month, your rent, pays someone else’s mortgage. If your rent is $1000/month, you will spend $60,000 in 5 years. $2000/month becomes $120,000, gone. Wow, that’s a lot of money. Wouldn’t you rather own your own property and pay your own mortgage? Let us show you how. 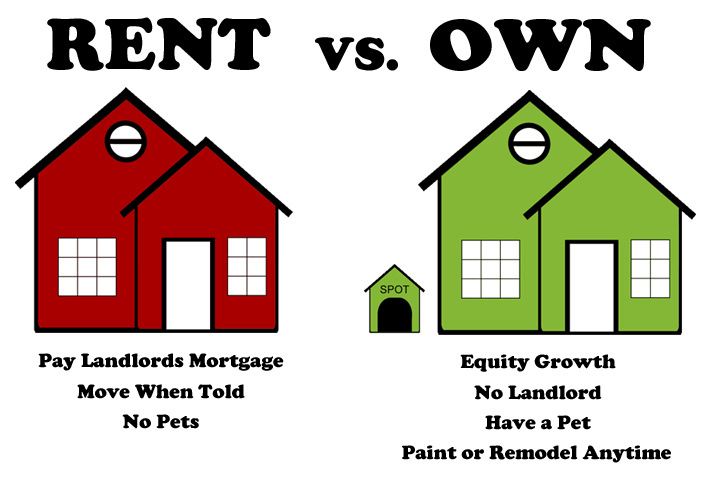 Most people don’t realize they could own in the same building they are renting, for very little a month more, than they are currently paying for rent! Why buy? To build wealth! Once you become an owner, you start building wealth, in the form of equity. Property values, and rent, generally go up year after year. Unlike renting, once you buy a property, you fix your payment at a certain level. Although the value of the unit may increase, you payment does not. What grows is your equity. After 5 years of renting, you have gone through a lot of money, but after 5 years of owning, what has risen is the value of your property, not the monthly payment. A fixed rate mortgage has a fixed monthly payment. As the value of the property increases, so does your equity. So if you decide to sell the property after 5 years, you generally get to put money in your pocket. This is tax free money. You can spend it, or better yet, use it to buy a bigger or better property. Each time you buy a larger property, it has greater potential for equity growth. This is how you build wealth buying property. Another benefit is that you pay less tax each year, because interest on your mortgage is tax deductible. You can take advantage of that deduction immediately, by increasing your withholding exemptions at work (w4 adjustment), thus lowering your withholdings. This will give you added money in your pay check to help pay for the slightly larger monthly cost of owning, over renting. An additional benefit of owning is peace of mind. No one is going to tell you when to move, your rent won’t increase, you can put up shelving, change the flooring and you get to paint the walls, any color you want. Most renters think they cannot afford to buy their first home. Actually many can and many more can prepare for ownership. You just need three things; a steady job, a clean credit report and a downpayment. 1. A steady job! Lenders want to know that you have the capability to pay back the loan. So they require that you have been steadily employed in the same type a business for a minimum of two years. 3. A downpayment! You will need a minimum of 3.5% cash down. So to buy a $300,000 property, you will need $10,500 down. You will also need some cash for closing costs, maybe another $2,000. Don’t have the cash? Don’t despair. You can use gift money from a relative. (Parents are allowed to give their children up to $20,000 a year, tax free.) Also there are organizations who will give you money to use for a downpayment, for FREE. If all else fails, start saving. Sooner or later you will have enough to get your first home. It doesn’t matter how small of a place you buy, you need to get into owning, or you will spend the rest of your life paying someone else’s mortgage. I personally started with a $100,000 Leasehold property and now own a $1,000,000 FS home and I started late in life. So if you’re ready to take the step up to owning, or just need more information, call us today. It’s really not that difficult.